Sometimes playing cards get lost, which makes the deck they came from useless for playing card games. Not to fear. You can use the remaining playing cards to make flowers. You can find pretty card designs at yard sales and thrift shops, too. This project is fun and quick. It is a great way to entertain preteen girls at a party or sleepover. It doesn’t cost a lot, and the children will have fun making their own playing card flowers. 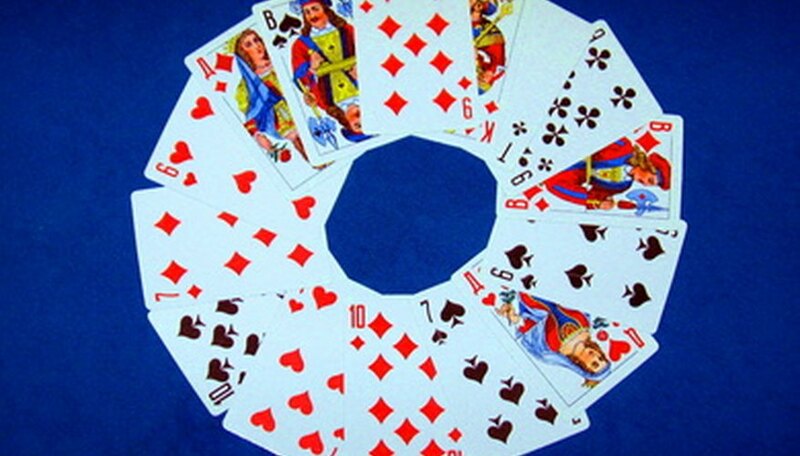 Fold one short edge of a playing card over ¼ inch. Crease well. Make another fold in the opposite direction ¼ inch. Continue making folds in alternating opposite directions until you have folded the entire playing card into an accordion shape. Press the accordion shape as flat as you can into one ¼-inch shape. Apply a thin, even coat of glue to the flat side on top. Fold the shape in half, lining up the ends evenly. The glued edge should meet itself. Crease well and hold until the glue dries. Another way is to weigh it down with something heavy like a book until the glue dries. Release the glued card from your hold or remove the weight. It will relax into a fan shape. Repeat Steps 1 through 3 for two more playing cards. You now have three fan shapes. Turn the fans so that the cards are all facing up. Apply a thin, even coat of glue to the bottom flat edge of each fan. Fit the fans together so that they meet at the center bottom points and fan out into a circle. Hold them together until the glue dries. Now you have a flower shape made up of three card fans. Use two or four or more card fans to make different flower designs. Use the flower either with the card faces showing or with the back of the cards showing. You can hot glue a clip to the back to make a hair decoration.